At just 12 pounds and 16.25 inches wide, the system fits in a backpack and can be transported to remote broadcast venues; making it one of the most portable broadcast quality Sports Graphics systems in the world. we have multiple solutions to fit your infrastructure and budget without sacrificing quality. AJT Systems’ proven technology runs on hundreds of mission critical systems at high profile sporting events both domestically and internationally 24/7/365. Using the same rendering and playout technology, the LIVEBOOK GFX® boasts the same reliability as a high-end rack based server system. 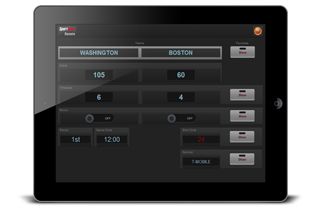 Paired with AJT Systems’ full-featured, sport specific score bug application, have your Score Bug ready to go right out of the box. Full support for Unicode fonts and both US and European formats, makes the system an ideal candidate for localized and multi-language applications. The system’s flexibility is enhanced by its built-in support for multiple clock interfaces including DAK, OES and Whiteway. Current SportApp™ offerings include: Basketball, Soccer, Baseball, Hockey and Football with support for additional sports (curling, rugby, volleyball, lacrosse, water polo, field hockey, etc) also available. 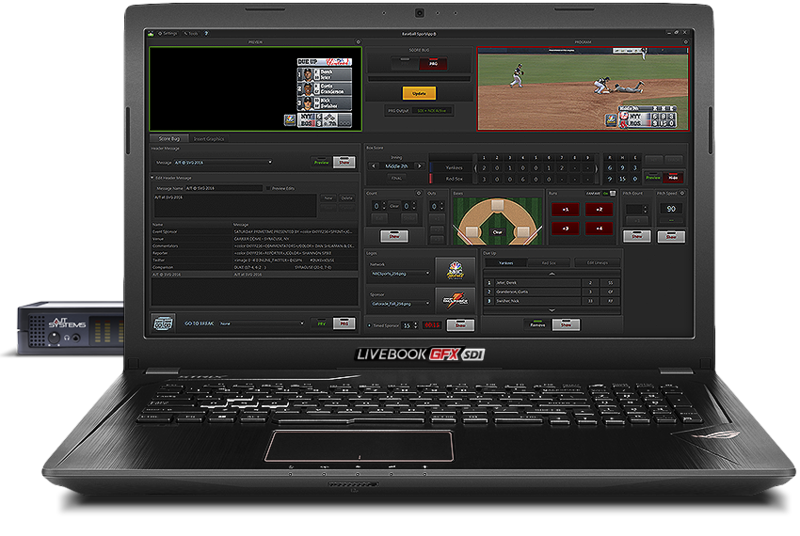 The LIVEBOOK GFX® SportApps are tailored to each sport to provide uniquely featured Miniboards, to promote ease of use, and to reduce mistakes on air. The redesigned SportsApps® UI is stunning and offers revolutionary features, such as the preview window. The score bug uses full motion animation and supports a preview channel, transitions for on/off air, show messages, score change, sponsors, etc. Included in the system is our Camino® editor for the on air look, which delivers advanced features with an intuitive interface. Additional sports to be released in the near future. LIVEBOOK GFX® includes Camino®, a flexible, intuitive, real-time 3D template authoring system. 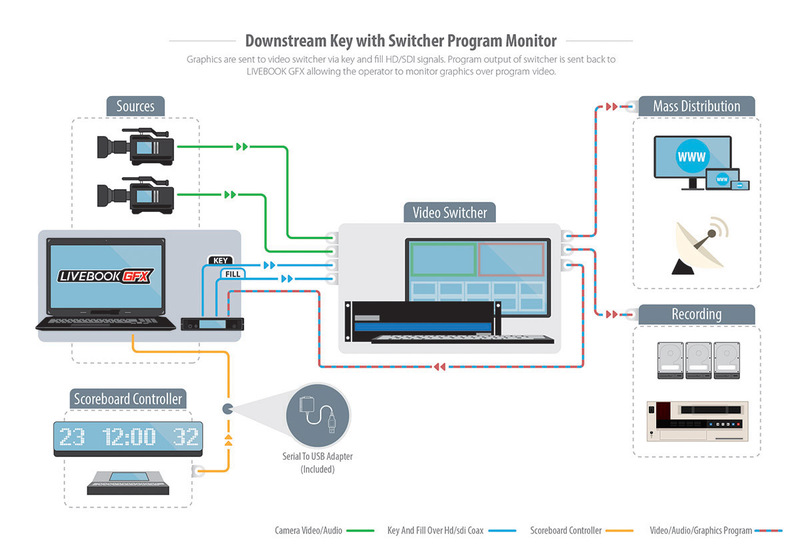 The system includes full Unicode support, advanced text formatting, support for multiple graphic file formats, video and audio clip playback, real-time keyframe based non-linear animation, 3D objects, and 3D DVE. 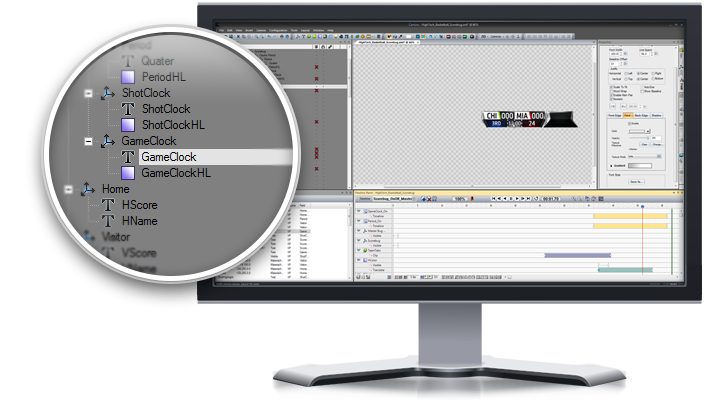 Rich, dynamic, content can be easily generated to create a unique look for your sports Score Bug. Broadcasting an event has become even easier with the SportApps® mobile application (available for Apple & Andriod devices). 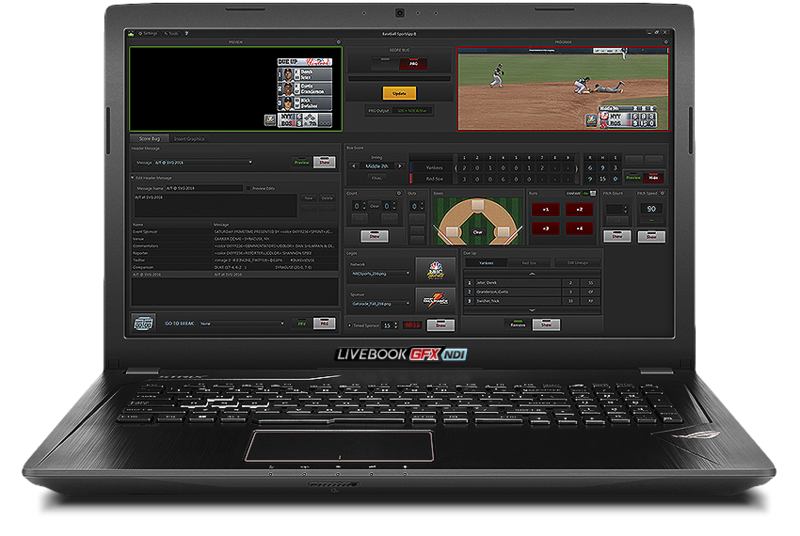 Whether you are on the road or broadcasting at a centralized location, the LIVEBOOK GFX®’s mobile feature will allow you to turn your smart phone or tablet into a remote control to quickly and easily update the score, period, etc. on air with the swipe of a finger. 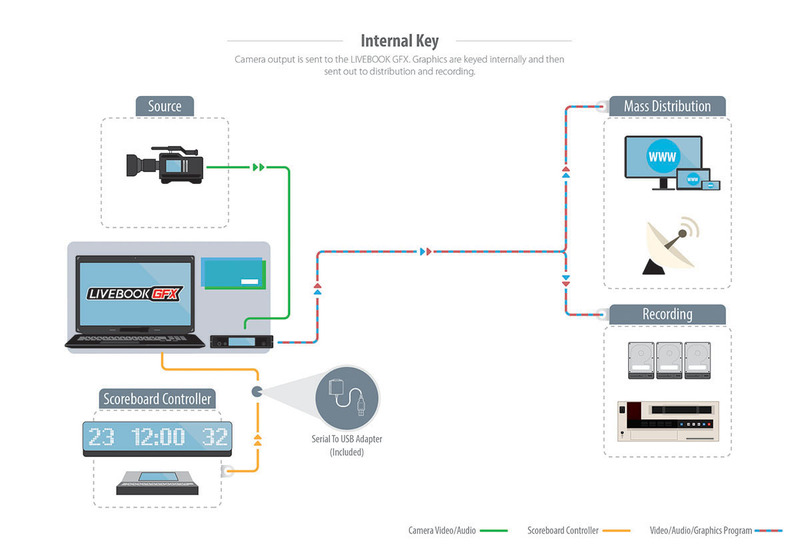 The LiveBook GFX™ is designed with flexibility in mind to fit every production environment and facilitate evolving work flows. 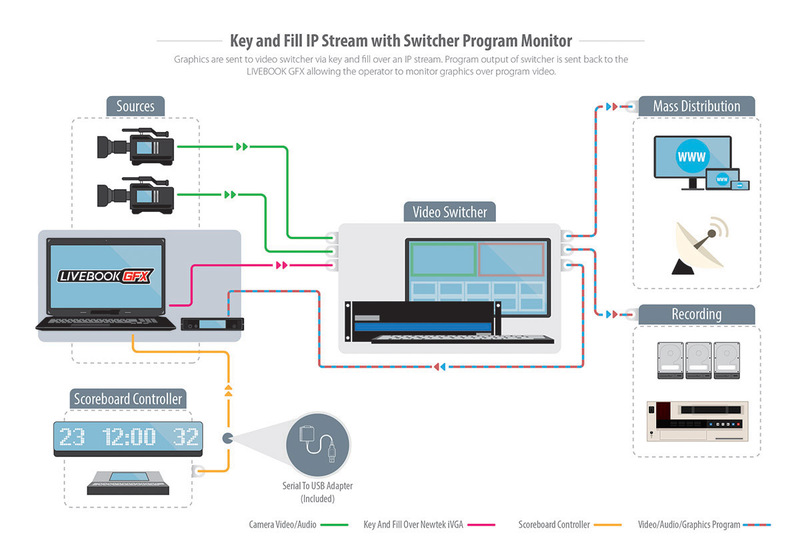 Whether your broadcasting over IP, or using SDI for internal or downstream keying, the LiveBook GFX™ will be able to adapt to your environment. Software Maintenance & Support includes quarterly updates and Priority Support.